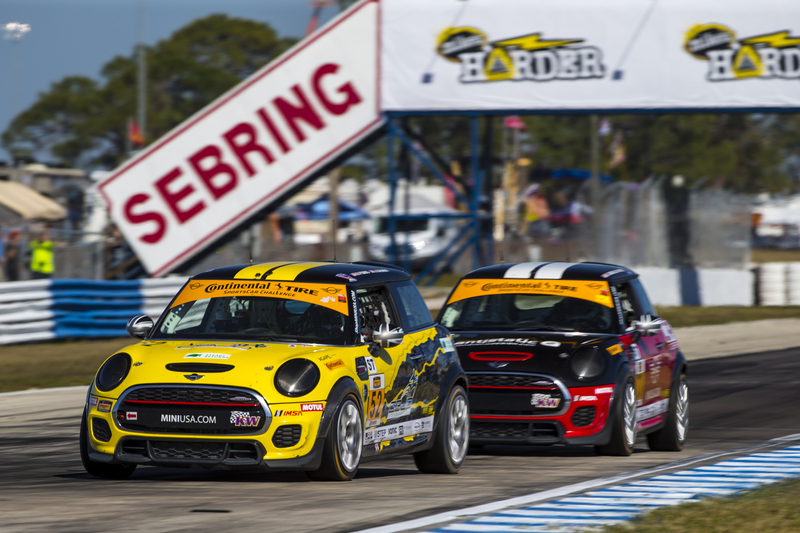 Sebring International Raceway was the site for round two of the Continental Tire SportsCar Challenge (CTSC). 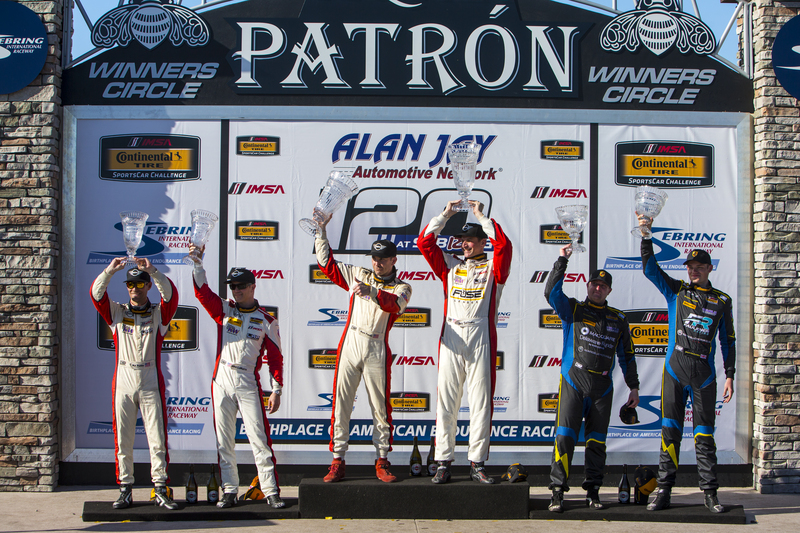 The two hour Alan Jay Automotive Network 120 was filled with excitement and quality racing from the MINI JCW Team. Nate Norenberg captures the pole at Sebring. After showing good speed in practice Nate Norenberg followed up the sessions with an amazing qualifying run. Norenberg earned his first career pole, and his lap time was almost a full second faster than second place qualifier Mike LaMarra in the 73. With the front row locked up for the main event the team felt good about their chances for victory. As the race got under way it was clear that the competition was going to put up quite a fight. The Daytona winning 81 BMW seized the lead early from Norenberg, leading the first ten minutes of the race. But Norenberg wasn’t going to let him get away. Norenberg, closely followed by LaMarra, stalked the 81, applying pressure at every corner. As the two MINIs pulled ever closer to the 81 Norenberg saw an opening that unfortunately ended in hard contact with the 81. LaMarra in the 73 assumed the lead as the 37 and 81 went through the spin cycle. All three MINIs had good speed during the race. Each one lead the race at one point. The 52 was the first of the three to pit, with Jared Salinsky handing the car over to Mark Pombo after a solid run. Shortly after their pit stop the caution came out. As the rest of the field pitted the 52 would cycle around to the lead. The 73 came in for their pit stop behind the 81, who had attained the lead again. But the MINI JCW Team pit crew had a solid pit stop, beating the 81 out of the pits and lined up for the restart behind the 52. As the race resumed the 52 and 73 of Mark and Mat Pombo took off. They put considerable space between them and the remainder of the ST field but not between themselves. They spent the entire rest of the race closely together, with Mat every so often taking a peek around Mark, looking for an opportunity to grab the lead from his younger brother. While Mat and Mark battled it out Derek Jones was having his own battle with the 21 Porsche for third. Jones did an excellent job with the wounded 37, despite the loss of power steering and the reduced braking abilities suffered after the early contact, swapping back and forth with the Porsche until the end of the race, eventually crossing the line in 4th. With Jones keeping the Porsche busy that left the battle for the win to be decided by the two MINIs. Mark held strong, and the brothers crossed the line in first and second to bring the team their first victory at Sebring. 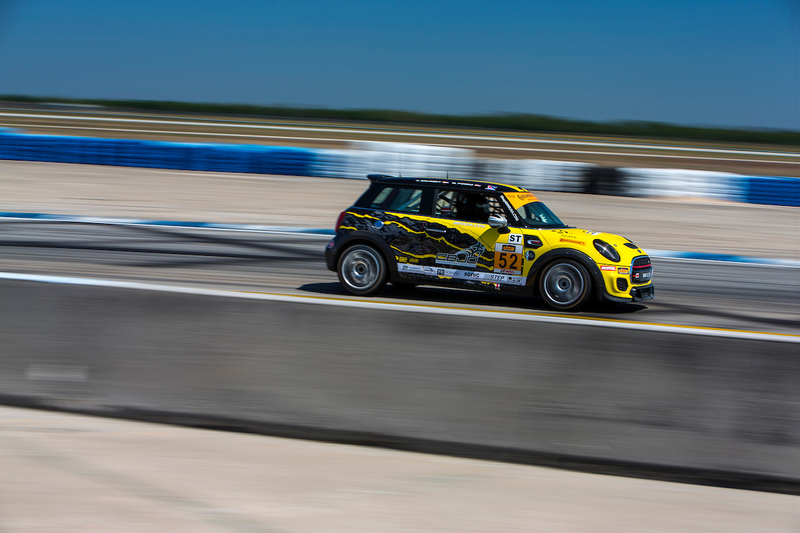 -This is the second 1-2 finish for the MINI JCW Team, the first being last season at Watkins Glen. 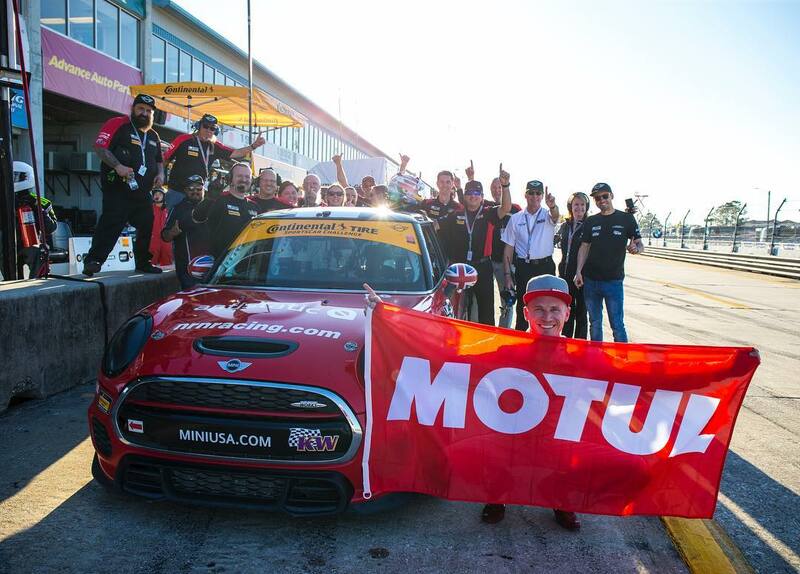 -Sebring marked the third anniversary for the team in CTSC. Next up on the calendar is the two hour event at the Mid-Ohio Sports Car Course on May 5th.